Book review - Lucky Star - - Where the fun begins! 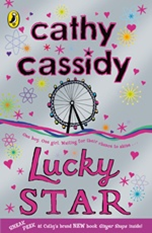 The book I’m reviewing is called ‘Lucky Star’ by Cathy Cassidy. The book was realised in 2009 and it’s target audience is towards girls aged ten to fifteen years of age. The recommended retail price for this book is £5.99 in all good book stores. The reviews for this book are excellent and make you want too read this book even more than just reading the blurb, here are some reviews off the Cathy Cassidy official website. “Lucky Star is an exciting book. I just couldn’t put it down, it was so wonderful.”. “I’m going to be camping out my bookstore waiting for this!”. The author Cathy Cassidy was born in Coventry on the 13th of June 1962. She wrote her first picture book for her brother when she was about eight or nine. She loved making comics when she was a little girl, she sold them too her friends for 5p an issue. She went too art collage in Liverpool, then got a job as a fiction editor in the fabulous and legendary Jackie magazine. For twelve years she got the job as the ‘Agony Aunt’ in the teenage magazine Shout! Later on in her life she married her boyfriend Liam, then moved too Scotland to start a family with him. Her children are seventeen and eighteen years old now and four of them live with her and her husband in a cottage in the Galloway hills. Here’s the blurb from the book that I’m reviewing and the sixth book that Cathy Wrote for teenaged girls, ‘Lucky Star’. “Mouse is doing his best to stay out of trouble. This is a must have book for you typical teenage girls to add to your collection, after you’ve read this you won’t stop reading books by the wonderful author Cathy Cassidy. Her talent of writing blows the minds of children and adults all around the world, so go and buy this book too experience the magic that Cathy brings to life in her books. Some other books by Cathy Cassidy are, ‘Dizzy’, ‘Indigo Blue’, ‘Driftwood’, ‘Scarlett’, ‘gingersnaps’ and ‘Sundae Girl’ just to name a few.